T’is the season to strengthen your relationships and boost your bottom line this holiday season. As the holiday season begins and a New Year is around the corner, meeting budget targets and increasing revenue will be top of mind. Now is the perfect time to stop to thank your employees and clients. We often underestimate the power of appreciation, and when it comes to showing thanks, a little can go a long way. Year after year, many companies extend the same gesture of thanks. Whether it’s a gift basket full of edible treats, tickets to a game, or a gift card, generic thank you gifts miss the mark. Personalized, thoughtful and meaningful signs of appreciation are often easy to do and have the biggest impact. Below are three easy ways to thank your employees and clients over the holidays. Unexpected perks leave a lasting impression and signal that you are going above and beyond to please. For employees, offering flexible holiday hours, a casual dress day or time off will go a long way. Cindy Ventrice, author of Make Their Day! 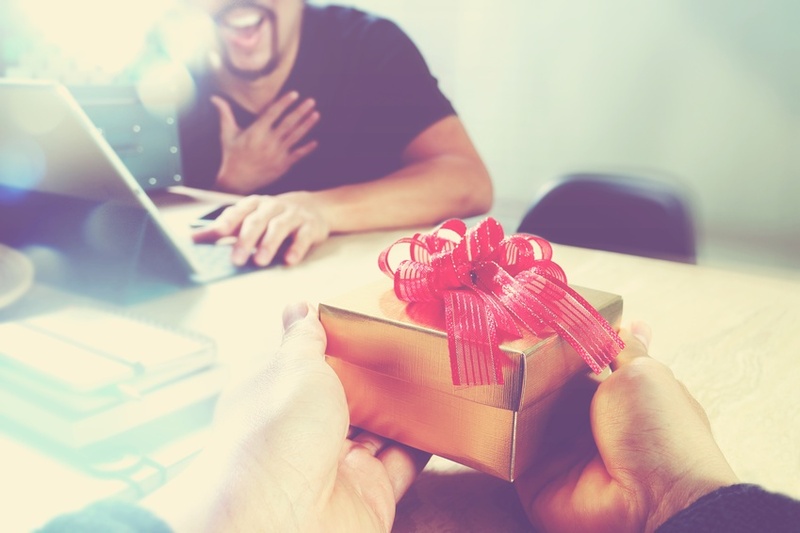 Employee Recognition that Works, says that “time off is absolutely number one.” Unexpected treats not only make people feel special but can also drive deeper emotional connections. You can easily surprise and delight your best business customers with a memorable client perk. Whether it’s hosting a dinner for your best clients, sending them a sneak-peak of an upcoming product release, or offering a generous loyalty discount, perks resonate with clients and deepen their loyalty. Plus, it gets them talking about your business, driving more clients and customers your way. It’s easy to overlook the power of appreciation, but the value of a handwritten note should never be underestimated. Showing that you have personally taken the time to recognize an employee’s contributions or the loyalty of your clients will have a powerful impact. Over 85 percent of employees say that being recognized motivates them in their job. If you choose to handwrite a personal note to your employees be sure to express your gratitude for their hard work and the unique skills that they contribute to the team. Surprise your clients with a handwritten note next time you send them a delivery or after sharing a cup of coffee or drink with them. Valuing your clients time by taking your time to write a thank-you shows real respect. A handwritten note proves to your customers that you value their business and are personally accountable for the service they receive. It’s easy to share thanks in the privacy of a one-on-one meeting or over the phone on a client call, but nothing makes a thank you go deep than public recognition in the holidays. When PepsiCo CEO, Indra Nooyi, revealed that she thanked the families of her employees, it made waves across business and leadership media. Inviting family members of employees or clients to a holiday dinner, or showcasing your employee or client successes on social media are some of the best ways to make recognition meaningful. Plus, you’ll be showing how much your organization cares about it’s clients, employees, and their families. Beyond the holiday season, focusing on your employees and clients, and not just the tasks that need to be done can have a big pay-off. Being appreciative should be a regular part of your relationship building strategy year-round, including when you are in the chase for the best talent. Remember, everyone wants to feel appreciated and the holidays are one of the best times to make a ‘thank you’ meaningful.